Yesterday I got a delivery from Blue Moon Fiber Arts. The skein on the left is STR lightweight in Gail’s Autumn Joy, and the skein on the right is STR mediumweight in Dragon Dance. Gail’s Autumn Joy is destined to be a semi-lacy scarf inspired by snakeskin, and Dragon Dance is going to be knit into a second Birdy Shawl, with a very much more updated pattern and chart. 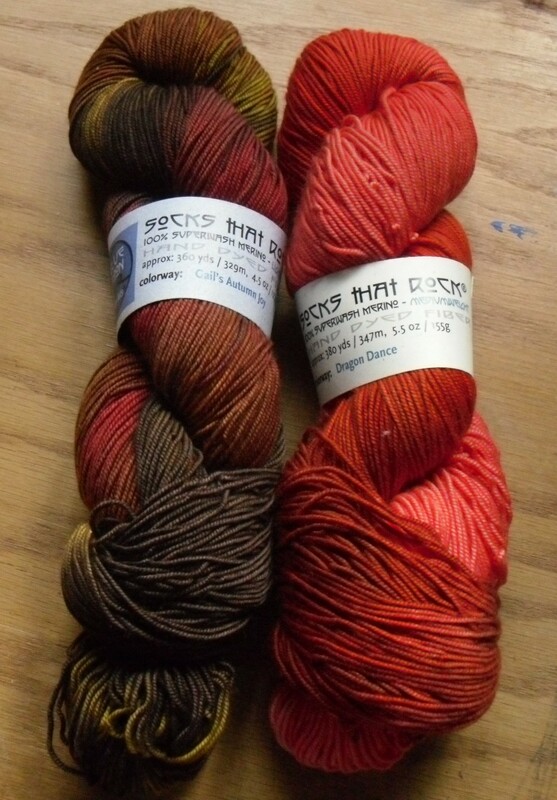 With the arrival of these two skeins I have a basket full of yarns to swatch. So, I’m planning on spending a large chunk of tomorrow first fighting with the printer, and then swatching, because other than Icy Fields and Que Sera (which is currently being ignored) I don’t have anything on the needles. So here’s two more Icy Fields photos. In this photo is a little closer and you can see more of the stitch definition. I’ve knit another 4 or 5 rows since I took the picture and hope to finish up the last two rows of the current repeat tonight. And this photo explains why 2 rows before bed tonight will be an accomplishment. 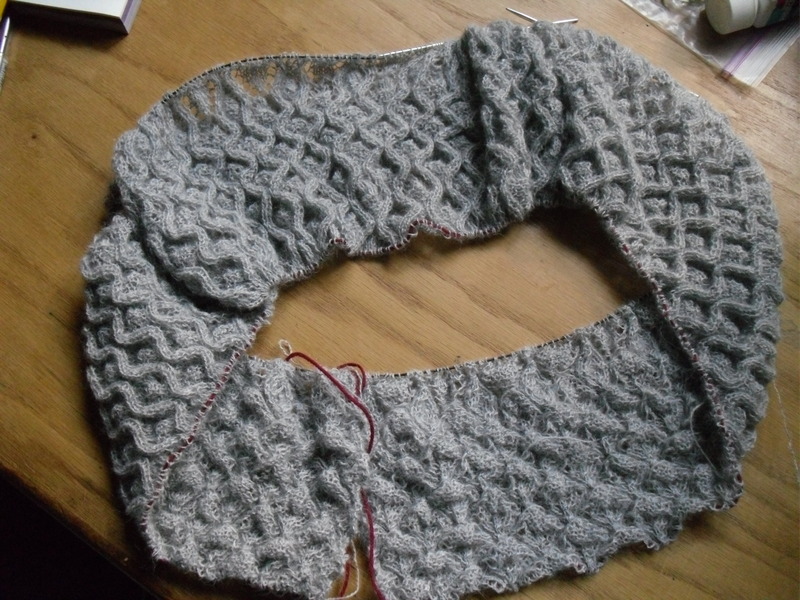 Icy Fields is a stole, and it is knit flat, although in the photo it kind of looks like it’s in the round. It is constructed so that you cast on length-wise, knit one half of the main body, pick up the stitches from the provisional cast on, and knit the second half of the main body. Then you pick up the stitches around the outside and knit outwards, finishing either with a crochet cast off, or a knit on border, I haven’t decided which. It’s progressing slowly but consistently, so long as I don’t force myself to work on it. Something progressing much faster on the other hand, is Belle. 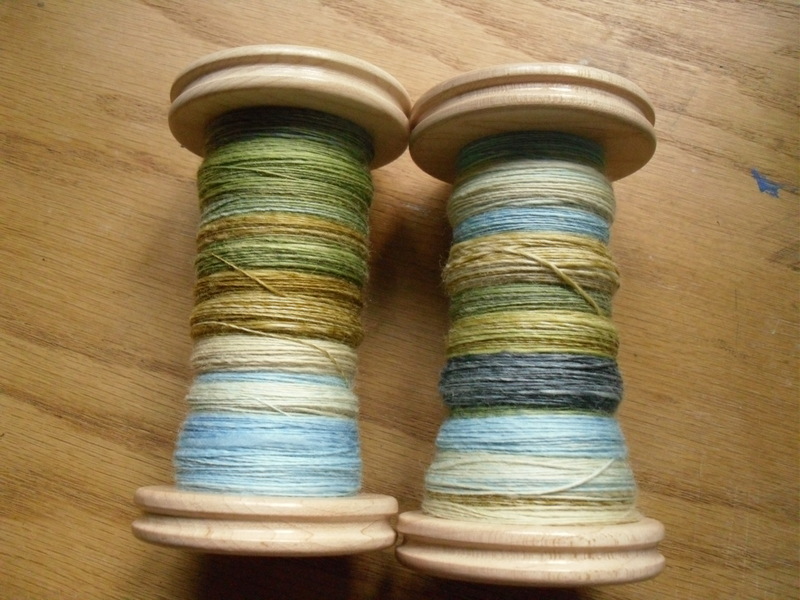 I finished both singles a few days ago, and started plying this morning, but I don’t have a picture of the plied yarn at the moment. Hopefully this will be done within the next few days, and then I can wash it plus a few other skeins I have lying around. 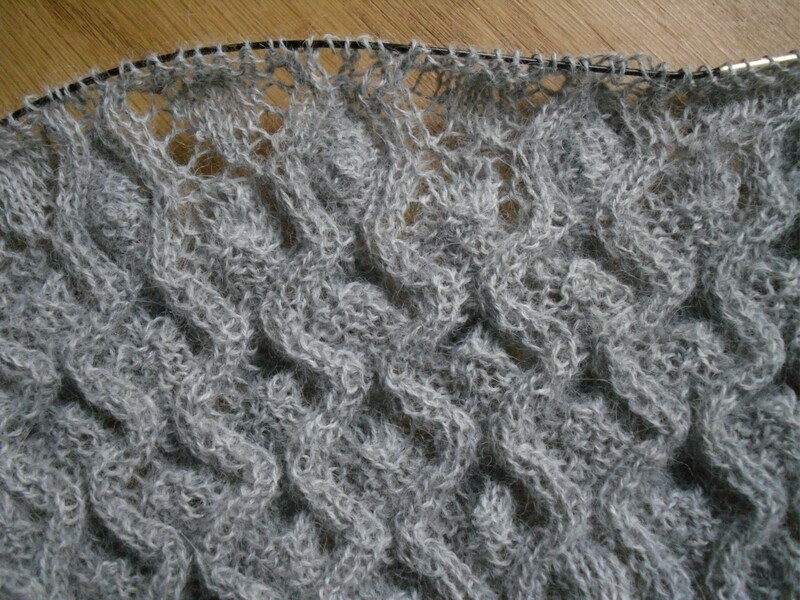 In other news, Climbing Trellis is up and on Ravelry. I’ll be posting about it, and putting a link up on the sidebar, within the next few days. My modified 10kH is going amazingly well. I ended up working on it for 13 and a half hours this week, which is making me feel better about the weeks that I kind of slacked off right after school ended. But I will end this post here and go work on Icy Fields.